Yesterday was mild, cloudy and rainy. There were several times during our travels where the weather was nasty. This morning has been mild, foggy and still. Today, we will catch an afternoon flight from Boston, MA, to Baltimore, MD, to Albuquerque, NM. The NWS in Norton, MA, forecasts (for Boston, MA) a cloudy day, with a 40% chance of showers and thunderstorms, and a high temperature of 75 F. The winds will be from the northeast at 6-8 mph. The NWS in Sterling, VA, forecasts (for Baltimore, MD) a mostly cloudy day, with a 60% chance of showers and thunderstorms, and a high temperature of 82 F. Winds will be from the northeast at 3-5 mph. They are currently under a Flash Flood Warning, and will remain under Flash Flood Watches all day. The NWS in Albuquerque, NM, forecasts (for Rio Rancho, NM) a sunny day, with a high temperature of 91 F. Winds will be from the northeast at 5-10 mph, becoming southwest in the afternoon. This evening will be mostly cloudy, with a 30% chance of showers and thunderstorms and a low temperature of 64 F. Winds will be from the west at 5-10 mph, becoming east after midnight. 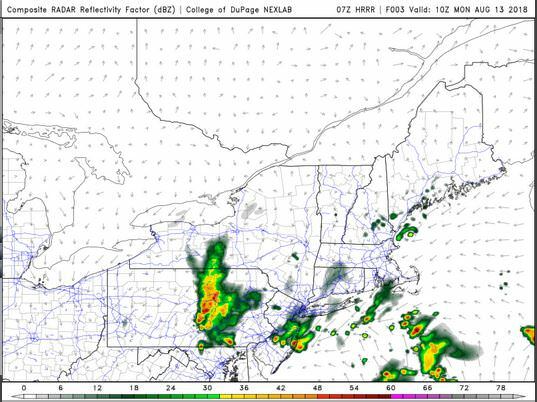 The HRRR simulated reflectivity shows that there is some lingering convection along our path to Baltimore. I will start posting normal Central New Mexico posts again tomorrow, as I begin my regular routine. This entry was posted in Local WX, Practicing Concepts, Predictions, travel and tagged #mdwx, albuquerque, Baltimore, Boston, flight, forecast, MA, Maryland, Massachusetts, meteorology, New Mexico, nmwx, weather. Bookmark the permalink.